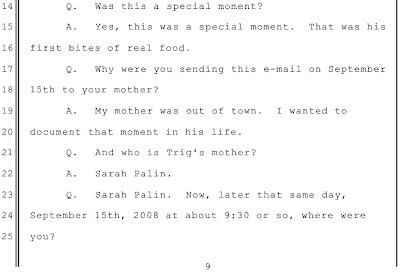 I was reading the testimony Bristol Palin had given in the David Kernell trial and thought there was something strange - a line of questioning by U.S. Attorney General Mark Krotoski regarding Bristol Palin being an unwed pregnant mother. In his cross-examination of Bristol, Krotoski had asked her to state who her parents were, what her mother did for a living, where htey lived, and if she was in school. This is where Palin stated that she was 17 and pregnant - a point the defense objected to on the basis that it was a sympathy ploy. Palin describes herself as a little girl home alone with her brothers and sisters while mommy is on the campaign trail and daddy is on the North Slope. Krotoski asked Bristol to name all her brothers and sisters before she goes on to talk about cell phones, and she stated Willow, Piper, Track, and Trig as her siblings. 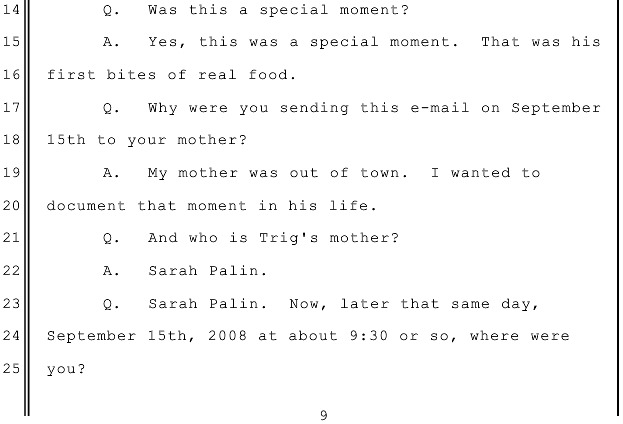 Now after some talk about cell phones and the leaked e-mails, one particular e-mail came into question - one containing a picture of Trig Palin. According to Bristol, she was taking a picture of Trig to send to her mother because Trig ate real food for the first time. It is this comment that prompts Krotoski to ask Bristol who is Trig's mother. I find that a bit odd considering Krotoski had asked about her brothers and sisters just moments before, where Bristol established to the court that Trig was her brother. I don't see any reason why there needed to be a question as to who Trig's mother was, especially when Bristol kept referring to him as her "brother?"